Exam season can be extremely stressful for both parents and kids. The pressure to perform well in the examination causes anxiety in students and parents. Helping your child to gain self-confidence, boosting their self-esteem by identifying and encouraging their interests and strengths and help them overcome exam fear by preparing them well ahead, is the key to nurturing your child for a better future. Here are some helpful tips for parents and children to be confident and exam ready. Manage your study holidays well. Once you get your exam time table, plan and divide your study time based on your subjects, difficulty level and exam dates. Do a lot of preparation by doing practice questions, model papers, and exercises. Seek help from your teachers or friends if you can’t solve equations or problems. Practice, practice and practice! 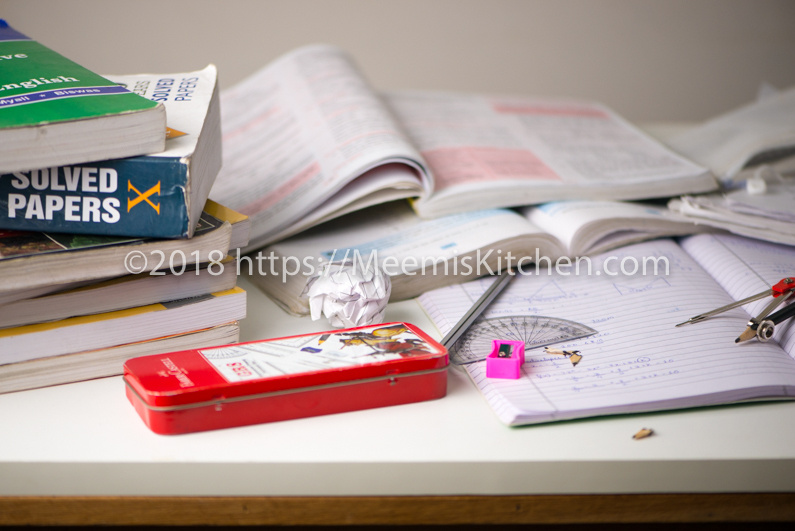 It is important that you study enough and long for about 45 minutes in a stretch and take some 10 – 15 mts break to have some snacks, drink water, listen to your favourite music, play some instrument to relax enough and prepare you for another hour of study. Practice deep breathing. Take deep breaths few times a day, breathing from deep within your abdomen. This will get more air into your lungs and will help you relax. Do some mild exercises, stretching etc. and move about. It is very essential that the kids get enough sleep, especially during the days before exam. Good sleep helps you remember what you have learned. So, make sure you sleep for a reasonable time. Always have positive thoughts; a positive mindset helps you imagine success in examination and keeps your spirits high. Now, this is my favourite part. Like every mom, I too was worried about what I should give my kids to improve their concentration and make them alert and energetic during exams. It is very essential that kids eat healthy and nutritious food during exam time. Give them few soaked almonds as they contain many vitamins and minerals like Vitamin E, Zinc, calcium, magnesium, Omega 3 acids etc., and are considered healthy for your brain and body. Make sure they have enough protein; Eggs, Milk products, Beans, nuts etc. along with lots of fruits and fiber rich vegetables. Give them lots of carrots and cucumber slices for snacking, include sprouts and vitamin C rich foods in their diets. A steady supply of minerals, vitamins and antioxidants keep them healthy and boosts immunity to prepare them against diseases. Give a break for ice creams, caffeinated or aerated drinks and sugary items. Also avoid fast food, chocolates and pastries. Kids often neglect good food and skip their breakfast often before exams. Make sure they have proper and healthy breakfast before they go for exams. Avoid milk before exams, instead give them fresh juices like Cucumber, Orange juice, Water melon etc. Smoothies and shakes are good during study time. But avoid adding sugar, instead add honey for a healthier version. Drink more water to keep you alert and hydrated. Dehydration causes tiredness, headaches and diminish concentration levels. Hope you find these tips helpful. Study well and above all, ask God Almighty for divine help. Always remember that nothing is impossible for God and He will help you. Pray before studying to help you remember what you have studied and do not forget to give thanks after your exam! All the very best for your exams. Do well. God bless!